Note: Instructors must be using Turnitin within a Canvas or ANGEL course in order to use the iPad application. Instructors using Turnitin from within ANGEL can generate a PIN code for the free Turnitin iPad app available within the iTunes store, as follows. Note: Codes can only be generated after a student (or you as the instructor) uploads a paper in to the first Turnitin assignment you create. Log on to ANGEL and enter your course. On the Lessons tab, select the Turnitin assignment. Select the link for any uploaded paper to open the document viewer. Click the iPad get class code access button in the lower left (just to the left of the printer icon). Click the get class code button. In the pop-up window that opens, click Generate code. The unique class access code will be displayed. Copy and paste this code to a safe place. Note: This code is valid for one instructor and one class only. Teaching assistants and other instructors in the course must each generate their own code. A code must be generated for each course section you teach. Download the free Turnitin iPad app from the iTunes store. Open the app and select the U.S. option. 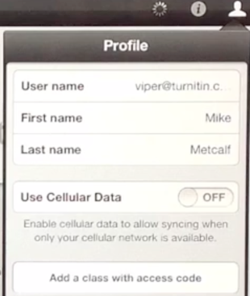 On the login page, tap the Access Code button above the login form. 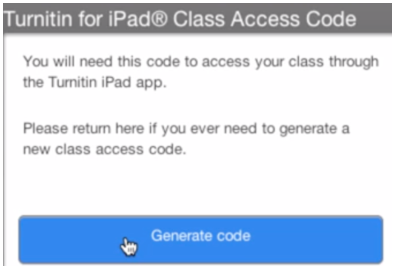 On the Add a class screen, enter the class access code you have generated. Tap the Add button. You will be directed to a profile page showing your classes. Enter the PIN code and tap Add. Tap the link at the upper right to see a list of your Classes and Assignments. To add a second class, follow steps in the "Generate a PIN Code" section above to generate a PIN code. In the iPad app, tap your profile link in the upper right. 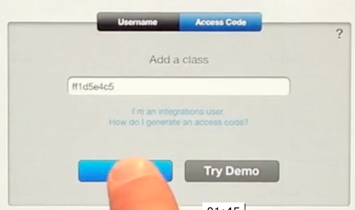 Tap the button Add a class with access code. Tap Add a class with access code. For details on how to grade content using the Turnitin iPad app, tap the Tutorial link within the app or view information at the Turnitin for iPad page of the Turnitin website. Caution: Some instructors have reported failures with using the offline iPad grading features to push grades to Turnitin.